Which Side of The Pitch Should I Play On? Here at 5-a-side.com I’m always checking and replying to various mails that people are good enough to send. By the way, if you’ve got something you want to ask, a comment you want to make, or you just want to say hi, please get in touch. Maybe your question can feature in a future article! Honestly, this question is not one that I think there is one right or wrong answer to, so I’m going to put my thoughts out there and I want to know if you agree. 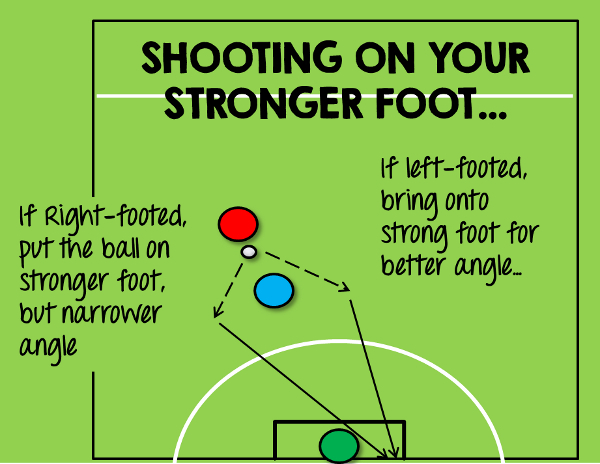 As most of us know, when it comes to the full game, if you’re left-footed you generally play on the left; if you’re right-footed you typically play on the right. Simple. The benefits of this are most obvious when you think about wingers and full-backs. When it comes to getting down the line and whipping crosses into the box whilst moving at pace, it’s hard to do that if you’re not using your strong foot (so if you’re left-footed you want to be crossing from the left). This is the move of the classic winger that we all know and love. Take Ryan Giggs as an example of somebody who did this beautifully in the Premier League for the best part of 2 decades. Of the players still playing, Leighton Baines is probably the one to watch – he puts in some little rippers with his cultured left ‘peg’ (translation: he crosses nicely with his left foot). So, crosses are the main reason, but in addition, if you’re a leftie on the left then the thinking goes that you’ll also find it easier playing the ball forward down the line or back inside with your left foot. Some managers who want their wide players to prioritise scoring, rather than providing crosses for teammates, like to flip the prior logic on its head and play a right footer on the left and /or a left footer on the right. Oooh, controversial. So, for example, that might involve a right-footed player being positioned on the left-wing. As an ‘inverted winger’ he’s going to find it a lot more difficult to cross from that side at pace, although he can still cut the ball back and swing one in with his right foot, but the time taken to cut back can really slow an attack down. Where the advantage comes, however, is that rather than going down the line on his weak foot, he can instead cut inside and look to shoot at goal on his strong foot. The best example of this currently has to be Edin Hazard. Jose Mourinho’s Chelsea have got him playing out on the left side, but you’ll notice he’s more right-footed (although he still has a great left foot too!). He’s scored a lot of goals from cutting inside on his right. So there are some good examples around, but playing with wingers like this, however, is still very much the exception rather than the norm. How does this translate to classic 5-a-side? The first point to make about 5-a-side is that because the pitch is so small and the play is constantly changing, there’s no way you’re going to be able to just stick to one side of the pitch anyway. You are going to need to move about as and where the play takes you – so don’t obsess about sticking to one side or the other rigidly. There should be a bit of change-around, as needed, but it’s still common for a player to favour taking up positions on one side of the pitch a bit more than the other. 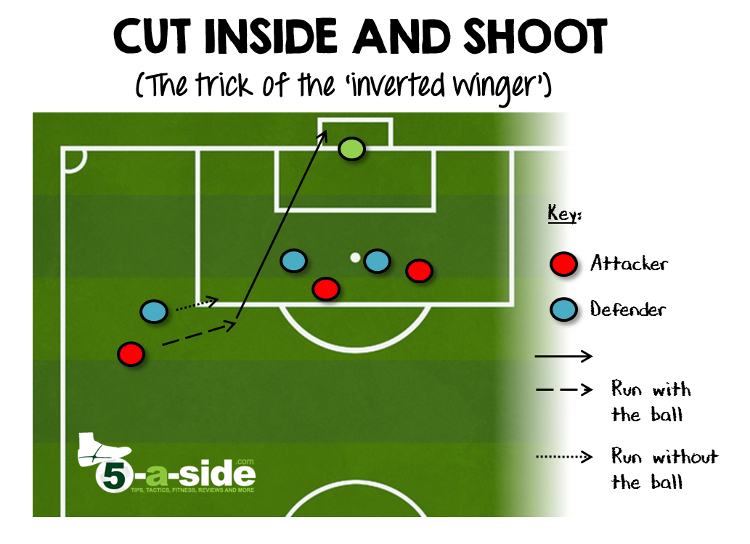 When you are coming up with a 5-a-side formation, you will probably acknowledge this in the way you set the team up. But, coming back to the 11-a-side logic for who plays on which side – it doesn’t all stand up in the smaller-sided game of 5-a-side. In classic 5-a-side, only the goalkeeper is allowed inside his area, so the idea you’re going to be getting down the line and whipping crosses in isn’t really a great one. With crosses not being important, what other rationale could you have for wanting a player on their strong side’? I’m right-footed and I can tell you that I comfortably prefer playing the ball down the line on my better foot. So too, if I’m making a run down the wing, I would rather have the ball on my strong foot, away from the defender. Lastly, if I was shooting from tight angles, I’d definitely want to be on my right. So on balance, I would probably prefer to play on the strong side. But, in doing that I’d be far less confident of cutting into the middle of the pitch and shooting on my left foot, something that gives me a better angle at goal. When I let fly with that one, the ball could either rip the net, or end up in the car-park. I’d much rather be trusting my right foot for a shot from distance! So, really, the side you play on doesn’t matter that much in traditional 5-a-side. In any case, the pitch is so small and the play is so fast that you are unlikely to spend your entire game camped solely on just the left or right side of the pitch. Just pick a side that feels comfortable to you and work from there. In futsal there are no rules restricting players running into the goal area. This means that the cross is very much a sensible tactic. I’m not talking about the cross in the conventional 11-a-side sense where you’re often trying to land it on the head of a striker. 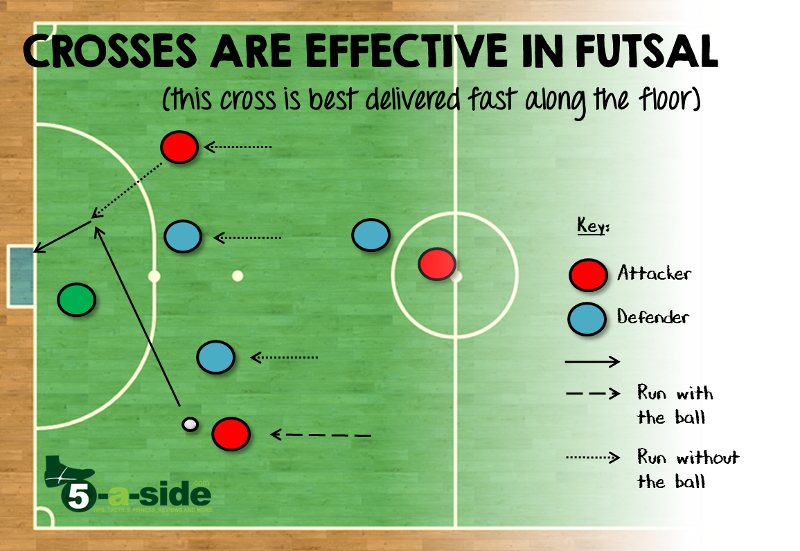 No, the cross in futsal is devastating when it’s played fast, along the floor for your teammate to run in on and smash home at the far post. It’s one of the most effective moves you can play, especially on the fast-break. To deliver this cross fast and accurately, most people will want to be playing it using their stronger foot. So, if it’s a move your team are going to try to exploit, you probably want your left-footers spending a bit more time on the left and the right-footers on the right. Again, don’t let any player glue themselves to a certain wing – it’s just going to make your formation inflexible and your play predictable. In small-sided football, it doesn’t really matter which side you start on as you’re going to be rotating around a lot. The only thing is that, when you’re shooting, you want to be doing that on your better foot. A good idea is to think about how you’re playing next time you’re on the pitch and be aware of what advantages and disadvantages you’ve got as you move to each side. In the short term, this will help improve your positioning and tactical play. In the long term, and this is probably an answer none of us want to hear, the best solution is to become very comfortable on both feet. But that’s another article. So you’ve heard my take on the issue, now I’m keen to know what you think about it. Let everyone know your thoughts in the comments below. Do you agree with the above – I really don’t think there is a right or wrong answer so fire away! Tell us what works for you. 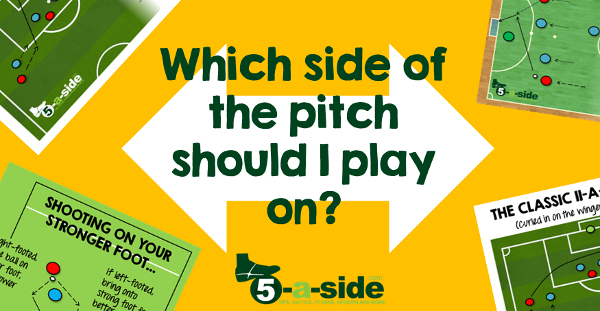 It can be as simple as saying what type of 5-a-side you play (traditional, futsal etc), which side of the pitch you favour, and why. Also, don’t feel left out if you’re playing 6-a-side, this site is as much for you guys as it is for 5-a-siders.